Size Please select an option Blue - 34 (85 cm), 4 lbs. Red - 30 (75 cm), 4 lbs. Green - 26 (65 cm), 4 lbs. Orange - 22 (55 cm), 3 lbs. Yellow - 18, (45 cm), 2 lbs. 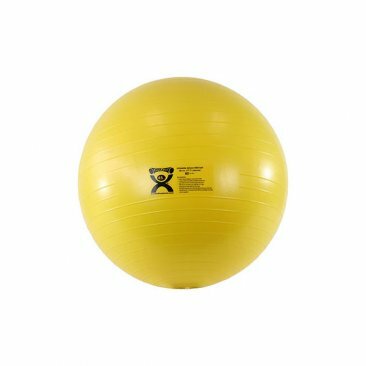 The CanDo Inflatable Exercise Balls are designed to improve balance, coordination, flexibility, strength, or can even be used just for fun. They are used as aids for vestibular movement and equilibrium therapy, by fitness professionals as an aid for stretching and strength programs, as seats, and even by pregnant women in birthing classes. The CanDo balls have a non-slip PVC vinyl surface that is ribbed for extra security. The balls may be 'under' inflated to give a soft, mushy feel or fully inflated for a firm, bouncy feel. These deluxe ABS inflatable exercise balls are made with a material that is specially formulated to release air slowly if a sharp object like a pen or pencil accidentally punctures the ball. This slow air release system is effective up to a 280 lbs. capacity. Available in various sizes. Blue - 34 (85 cm), 4 lbs., Red - 30 (75 cm), 4 lbs., Green - 26 (65 cm), 4 lbs., Orange - 22 (55 cm), 3 lbs., Yellow - 18, (45 cm), 2 lbs.